Witanhurst is an early twentieth century Georgian Revival mansion located on five acres (20,000 m²) in Highgate, North London. It commands some of the best views in London and is Grade II* listed. The original house, dating from 1774, was known as Parkfield. 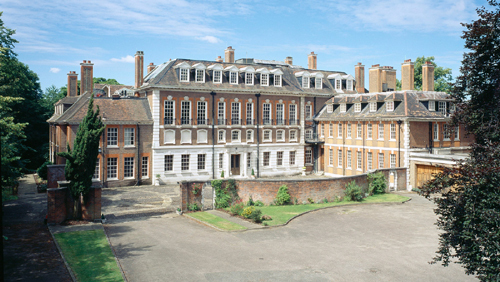 It had a picturesque range of stabling and was situated in a position adjoining Dorchester House to the west. At the end of the nineteenth century it was acquired by a stockbroker, Walter Scrimgeour, for his wife and eight children, for whom he added a schoolroom, nurseries, a gym and a billiards room. Parkfield was demolished and the current house was built between 1913 and 1920. 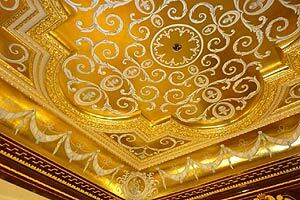 It was designed by architect George Hubbard for the Liberal MP and soap magnate Sir Arthur Crosfield. He married Domini Eliadi, the daughter of a Greek merchant who was once the ladies’ tennis champion of Switzerland. The couple spent £1 million ($2m) building a 40,000 sq ft (3,716 sq m) Queen Anne-style palace in which to entertain London society. Sir Arthur added four tennis courts – two hard, two grass – which were to become the main attraction. 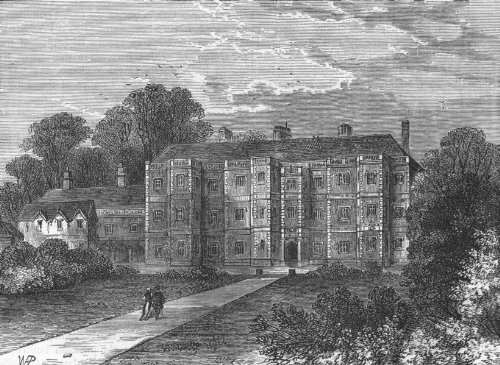 Sir Arthur chose Witanhurst, a combination of the old Anglo-Saxon words “witan” (meaning a parliament) and “hurst” (a wooded hill) as the name for his house. It has 65 rooms spread across three floors, including 25 bedrooms. One of the largest is the Grand Ballroom, measuring 70 feet (21 m) long with a height of 20 feet (6.1 m). 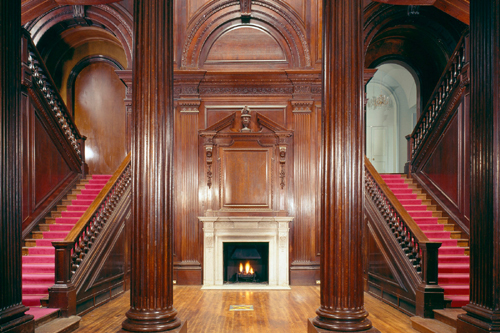 It has oak flooring and the timber wall panels are in walnut, with a carved and gilded cornice. 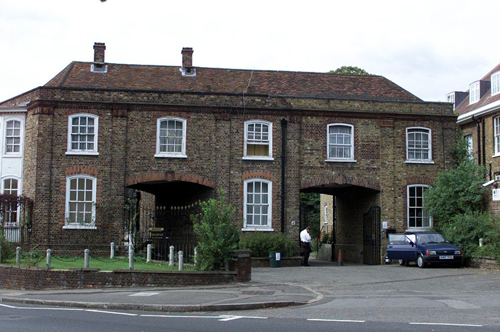 Access to the property is via a double-arched gatehouse. Every year, after the Wimbledon championships, the international tennis stars and society figures would take part in a series of charity tennis parties on the Witanhurst courts, which soon became an established part of the London Season. The future George VI played there, watched over by his wife. Other players included Princess Alice, Countess of Athlone; Princess Juliana of the Netherlands and Princess Ingrid of Sweden. Music was also important: Sir Yehudi Menuhin became such a great family friend that he lived in a wing at Witanhurst for a while. The Crosfields were also active philanthropists and campaigners, and it was Sir Arthur who led the fight to save nearby Kenwood House’s 130 acres of north London woodland from the bulldozers and turn it into a public park. However, in the mid-1930s Sir Arthur lost a fortune in a failed Greek mining venture and was killed shortly thereafter, falling off a railway sleeper car in unexplained circumstances. At Witanhurst, Lady Crosfield’s tennis parties continued, even during the Second World War, when they were used to raise funds for bombed-out families. The house became an RAF entertainment centre, and, after the war, royalty and celebrities flocked back. Meanwhile, Lady Crosfield was fast running out of money and gradually the tennis parties came to an end. After her death in 1963, the house passed to her adopted son, Paul. By 1970, however, the thrice-married heir could no longer afford to keep Witanhurst and sold it for £1.3 m ($2.7m). Witanhurst has been used on several occasions as a filming location by various production companies including the BBC, to shoot films and television programmes such as The Lost Prince, Tipping the Velvet, and Fame Academy. The house has not been regularly occupied for some years and no attempts were made to preserve the estate. The local Council had announced that they will be requiring the owners to take steps to stop the deterioration and English Heritage placed the property on its Buildings at Risk Register. In 2007 the mansion was sold to private developers, the St John’s Wood-based Marcus Cooper Group, for an estimated £32m ($65.6m). They announced their intention to convert it into a £150m ($307m) home; however, within weeks it was back on the market – untouched. Witanhurst was bought for £50m ($102.5m) in 2008 and is now being refurbished. I was asked for advice on paint colour. Very interesting post. I know the area very well but I knew little of the history of the house. I had thought it was much older for example. I hope the new owners are sympathetic.